Part of me likes the idea of a basic universal framework for miniatures games. Systems like the Command and Colours series of games. The upside is that it becomes easy to remember how things work and common base sizes and mechanisms allow easy sharing of a tabletop and terrain. especially if you are using a grid and building armies from scratch. The major downside is that the rules can start to get too vanilla and lacking in flavour if one isn't clever enough and the incentive to do multiple periods declines if all the games are similar in overall feel. There can also be issues with getting old armies to conform. I'm pondering the question again for all my collections, looking for the best way to differentiate them and give each one a distinct feel and a reason to exist. 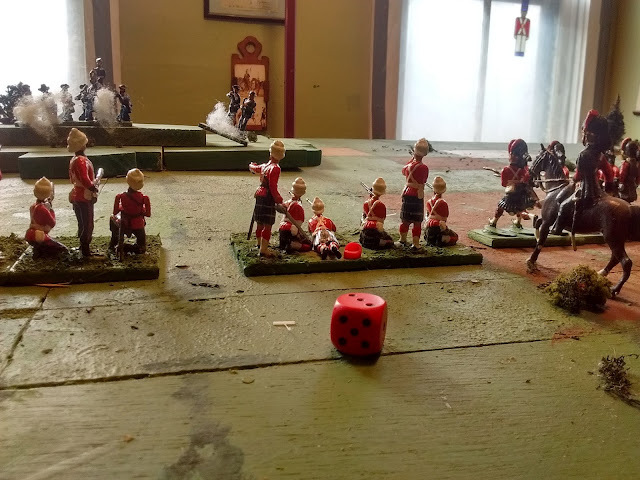 A toy soldier game, a quick, easy to set up in a small space, play and take down game, an all day game, a wargame to refight historical battles, maybe a low level skirmish game and so on. Early stages of testing revived rules and scenario. 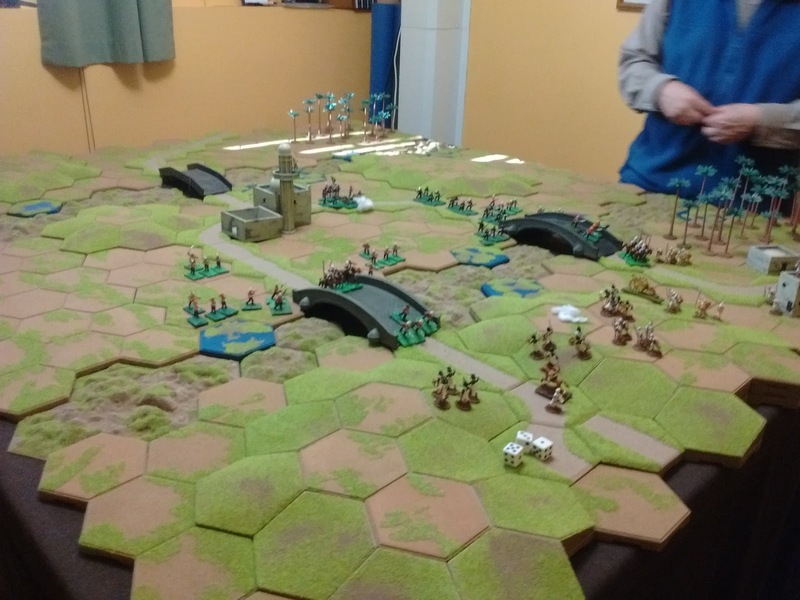 In the meantime, or perhaps in the spirit, I am spending much time at the moment working on the 16th Century Anglo-French wargame that Rob and I will be co-hosting at Huzzah in May. but that will be covered on my Gathering of Hosts blog. Uhoh! Shouldn't ha' done that! I finally got to watching the 1938 Post-WWI North West Indian Frontier movie "The Drum" on Youtube. The Relief Force struggles to get there in time. 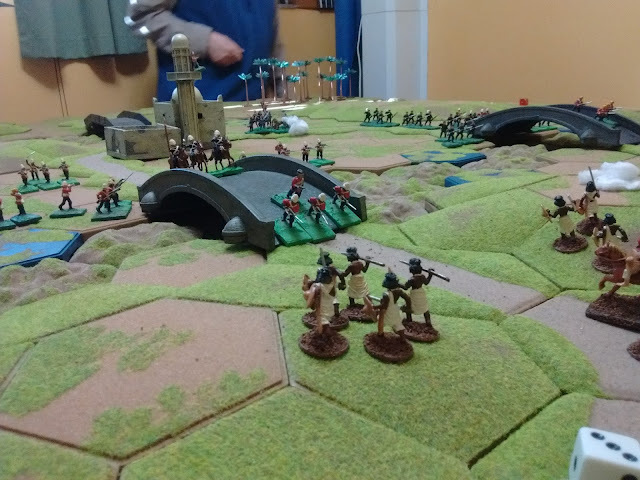 By halfway​ through I was reminiscing about old MacDuff Colonial skirmishes with single figures, by the end I was trying to figure out what to use for "Natives" since the Scruby 40mm Colonials haven't reappeared,......must go lie down in a dark room until I feel better. 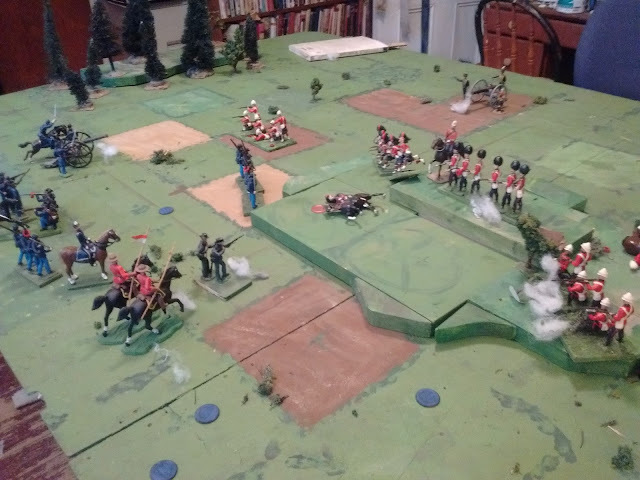 Ron and I played another Colonial Portable Wargame today. A call to arms from Minaret instead of a call to prayer! The scenario this week was the first Initiative scenario from Asquith and Grant's Scenarios for All Ages (the Red Book). The attacker (randomly selected) has to march on and seize crossings over both rivers. The defender who gets dribbles of reinforcements has to prevent any crossings, a very hard task though a draw is very possible with the right combination of luck and skill. Overview as cavalry race back with orders for the reserves to hurry forward. Ron had originally set this up for Sudden Death using strength points with a total of 13 (12?) units attacking 9 but raising the Exhaustion levels but after a discussion we decided to double the number units to 18 vs 26 (or maybe 24) and use sudden death. The Elite status of the Hadendowah allowed them to survive three repulsed charges. Three hours later we had played some 15 or 16 turns full of nervous tension and swings in advantage. It would be interesting to play with fewer units using the strength points for unit destruction but with army exhaustion based on lost units. That would have allowed the garrison in the town to give up SPs to avoid retreating thus increasing the odds that reinforcements would arrive early enough to seriously contest the first bridge but it would mean fewer miniatures on table unless we really packed the hexes. It might well have had less tension on each die roll though! Its over. The Mahdist force is exhausted by its losses and incapable of further attacks on the British bridgeheads. Ron's last reinforcements never came off the shelf, the slip of paper listing them just marched up the road as a reserve! They did their job though Ron lost almost as many units as I did but didn't reach exhaustion due to his larger force. All in all, the set up may not be easily portable, but it was a cracking good game! Last Sunday I followed up the Square Brigadier game with several repeats using the Portable Wargame as part of my preparation for Huzzah!. I'm not going to go over them in detail but just make a few observations about all of the games including the SB game and rules. 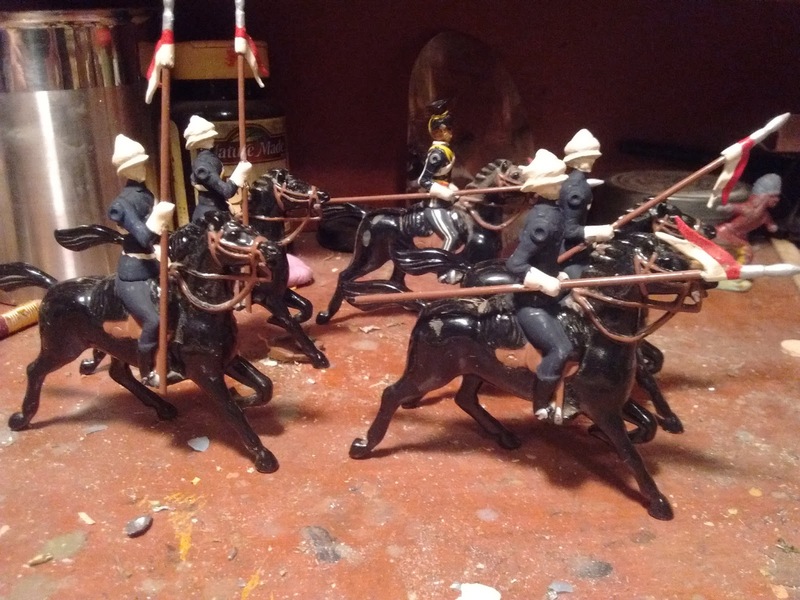 These, like my US cavalry, are converted from the Britain's Light Brigade that I was lucky enough to buy from Stuart Asquith around the turn of the century. They were the mainspring of my 54mm Colonial games and helped convert me to using glossy Toy Soldiers. Since my Crimean plans never got far I decided to convert them rather than let them go. Since I had enjoyed the Sudden Death game at Ron's but was worried that my intended 6 unit OB would not be enough for a decent game, I started there. The game took about 25 minutes to play 5 out 15 turns which was a little quick but not bad for a walk up and try it event. It wasn't terribly satisfying though and I felt that a few more units might be needed to add some depth. I couldn't shake the feeling that the Sudden Death version reduces the player's tactical options and devalues reserves. I decided to reset and try the standard roster system now that I realized that the exhaustion point was 1/3rd SPs rather than 1/2 units as I had wrongly played it in my favourite of the Zulu games. The game lasted about 9 or 10 turns and close to 40 minutes but it ended with only 1 unit destroyed and the nearly intact Canadians (unit wise) standing staring at the victory objective, daring the Yanks to come out from behind the hill and fight. It wasn't bad but it wasn't really satisfying either. 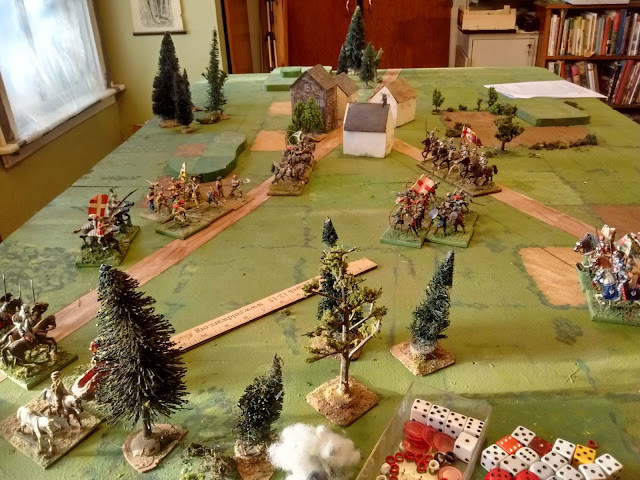 With the Canadians exhausted by long range fire then forced off the hill by an American counter attack, the Americans decline to step over the crest and be shot at. Since an exhausted force cannot attack, Game Over! Since the best game yet had been the Zulu War game that used the standard Strength Points to determine when units got removed but wrongly based exhaustion on 50% of units destroyed, I reset and played again using that variation. 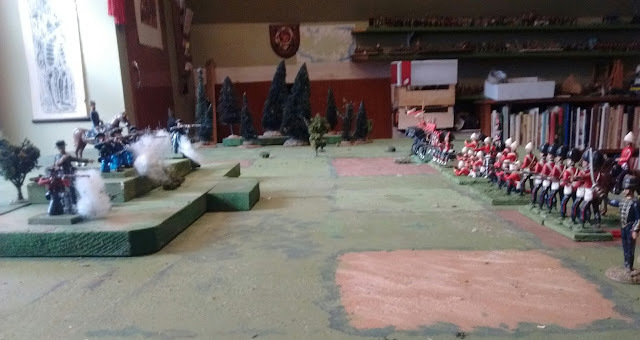 This time the game went 14 out of 15 turns after various turns of fortune with the Canadians hanging on desperately to a foothold on the hill which would have been a draw and the Americans only avoiding their own exhaustion point by pulling back badly damaged units until need brought them back in a risky but successful bid to clear the Canadians off the hill for a victory. About half way through the third game. An American flanking counter attack combined with a pinning force is proving hard to deal with as casualties mount. This mix of units being destroyed by Strength Point loss but Exhaustion being determined by % unit losses isn't official but it produces the most enjoyable games for me since it allows players to make more "Command decisions" such as to choose to risk trading SPs to hold ground or to conserve strength by using reserves to replace frontline units that have taken heavy losses and also allows players to engage in more than one or two stiff fights so that is how I will run the games at Huzzah after explaining the published mechanisms. As far the Square Brigadier, it (unsurprisingly) remains my game of choice for my small games at home. It has however taken a step back, away from Tin Army heresies and closer to its roots. 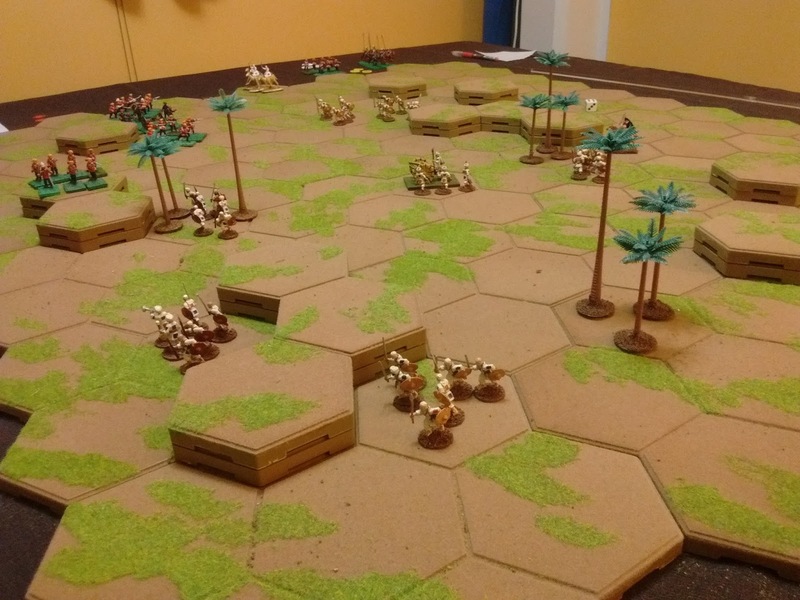 The Tin Army will continue on towards being a more convention battle game, essentially a gridded version of Hearts of Tin but the SB will remain more constrained and designed only for small stylized games, essentially my equivalent to Thomas' One Hour Wargame and doubtless often drawing on his collection of minimalist scenarios. I'm partway through updating the latest War of 1812 draft into a final 1812 to 1885 (non-European) version. Thankfully no new ideas or rules will be introduced, just a few intrusions purged and much (hopefully) clarity and completeness added in both Basic and Optional Advanced rules. Next, time, back to the 16th Century. The following is an excerpt from an anonymous journal thought to have been penned by an officer in the Hochelaga Fusiliers who participated in the little known Cyprus Hills Expedition. 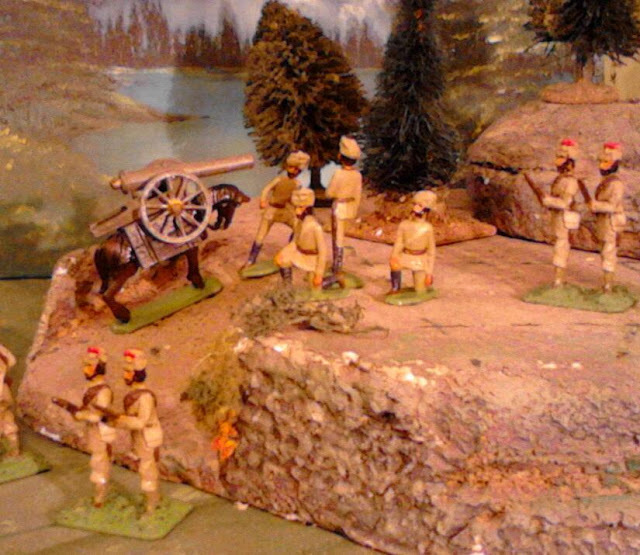 The first shots are fired as the Canadians advance into range. ....as we approached the ridge the order came to deploy into a single line with no reserves. "A" battery formed on the left of the infantry, the lancers of the NorthWest Constabulary formed on the far right. When all was in order the bugles rang out and we started forward. Every once in a while we caught a brief glimpse of a rapidly moving figure on the crest but it was hard to tell how many were there and what there intentions were. As we neared the foot of the hill though the skyline erupted in smoke and a positive hail of bullets rained down on us. Quickly the gunners opened up driving back a taggle of ragamuffins from their right flank. All along the line the boys advanced, fired a volley then fixed bayonets and drove the enemy off the crest with a cheer. The sight from the top soon sobered us up though. 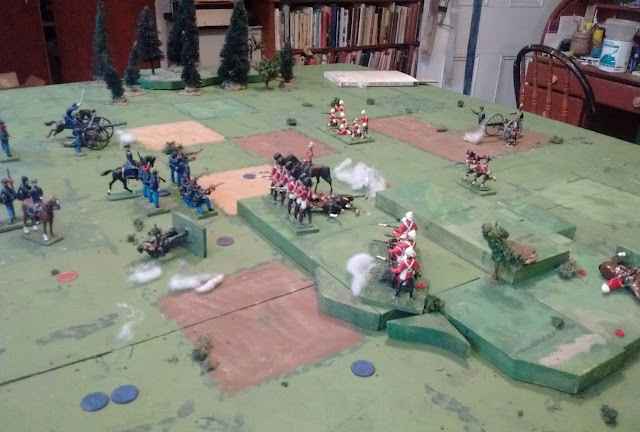 The Canadians seize the ridge as American reinforcements appear. From the top of the ridge we could see the enemy we had driven back but also a force twice their numbers rapidly marching towards us, complete with artillery. We lay down on the crest and opened up on the enemy before us while behind us the guns limbered up and rushed to the right passing the Lancers who were galloping towards our open left. The American force is stubborn under fire and deadly accurate but their General is having trouble coordinating an attack on the ridge. The American fire was deadly. Our Colonel went down as we hit the crest and many other good men were helped back down the slope to be bandaged but we held firm and they seemed unwilling to get too close. Seeing their flank open the Lancers rode forward and launched a rash attack. The Americans quickly turned and shot down the half of them. Recoiling they tried again and again, until none were left in the saddle. Perhaps mounted Riflemen would have been more useful in modern war. The American counter attack has stalled under heavy fire and the need to deal with the flanking cavalry. At last after two gruelling hours of intense fire, the Americans seemed on the point of launching an assault. As we braced ourselves, Colonel Marten himself rode up and called out " Fusiliers! Lets see these buggers off. Fix bayonets and follow me!" He spurred down the hill and rising up, we followed cheering. It was too much for the Fenian rabble in front of us and they turned tail and ran. With their flank wide open and half their companies scattered to the winds or limping to the rear, the Yankee regulars had little choice but to fall back as well. It was over. 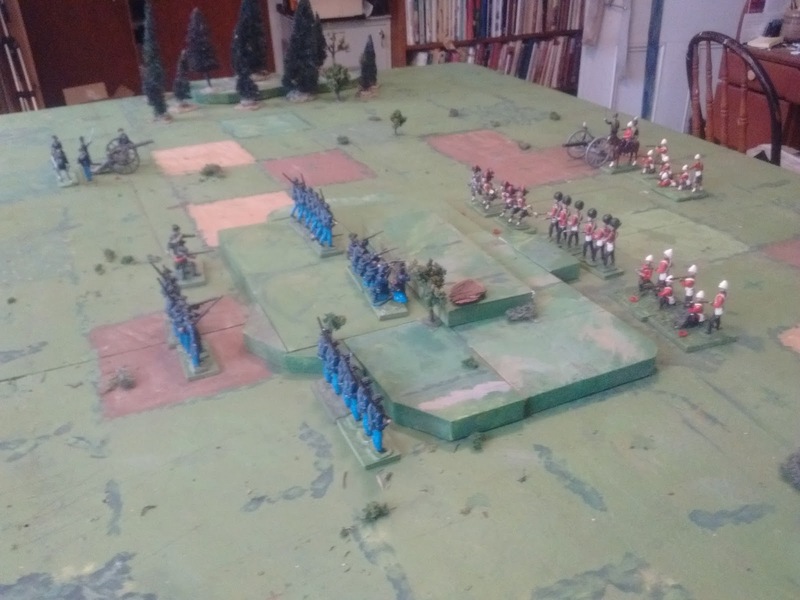 Note: these pictures are of a recreation of this engagement fought out with 54mm figures and the Square Brigadier Rules. The Blue and Red dots indicate where stands or Officers were removed. More discussion of the tabletop battle to follow. In the middle of the Disputed Territory, in the middle of the wide Prairie, is a low hill known locally as Lookout Ridge. Its not much as ridges go but being the highest point of land for miles it makes a good observation post. When agents reported that the Americans were planning to seize and fortify the ridge in order to set up an experimental Heliograph station, Colonel Marten was ordered to take a detachment out to see them off. The American advance guard opens fire with deadly accuracy. 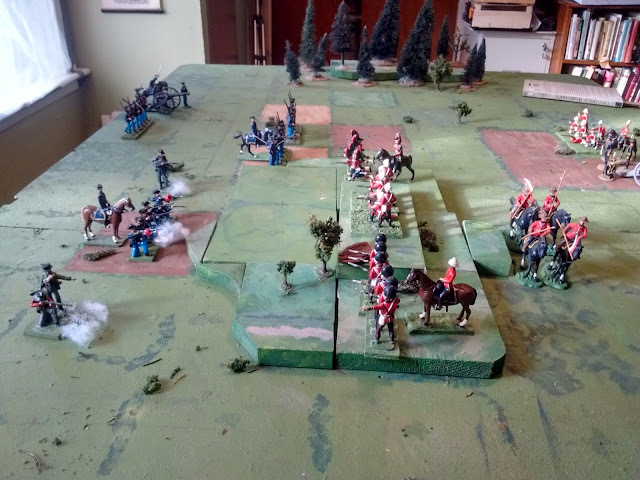 Battle Report of this 2 Hour Square Brigadier version of a One Hour Wargame to follow Sunday afternoon. OK, I've been having fun, no question, but its been over a week since my last game and two weeks since my last home game. Time to push away from the desk and play something. 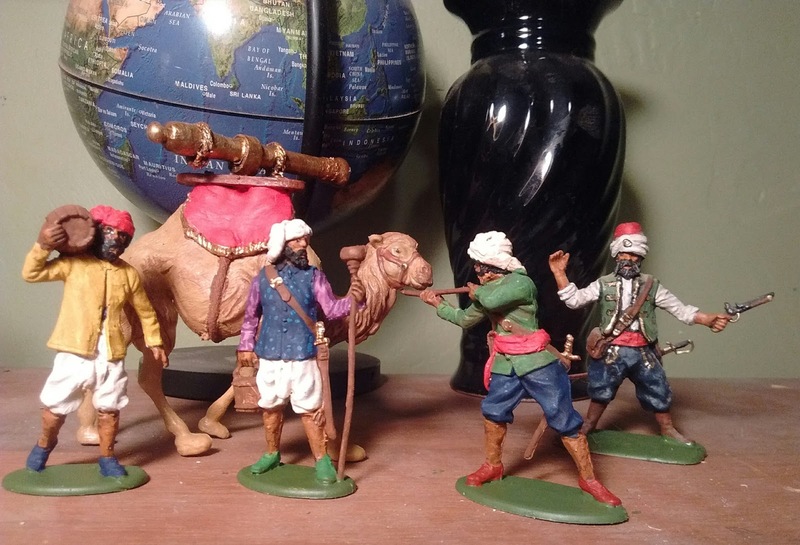 I picked this 54mm plastic camel up almost 20 years with vague thoughts of a Zamburak for the Emir. Well the Emir and his lair have gone but it seemed like the time to finally do it. The gun is more than a bit crude and is rather over size but it was the only way I could make it a working gun that actually shoots. The question is, once I clear all the c**p off my table, what shall I play? At the moment its even money between a 16th Century game to get me thinking about my main effort for Huzzah and a 54mm Cyprus Hills game, perhaps played twice with duelling rule sets, Square Brigadier vs Portable Wargame. These 17th Lancers you will see in action here, but not this weekend. There's too much work left to do on them. Not much to talk about, I've been too busy chopping and painting and otherwise having fun. So here are the first two finished units. Gordon Highlanders. Dressed for Egypt till the boat sailed right by without stopping. All repainted vintage originals but the officer is a conversion. Up next, Seventeenth Lancers in foreign service helmets followed by the Royal Artillery. This last week has been full of nostalgic pleasure. Long before I was a wargamer I fell under Henry Harris's spell and converted all my old Britain's Toy Soldiers into Model Soldiers. I hacked and glued and puttied and painted to make unique poses and uniforms. From there I went on to smaller figures and detailed, shaded, matte finish models for wargaming. Even when I started buying recast Britain's 20 years ago I turned them into models. 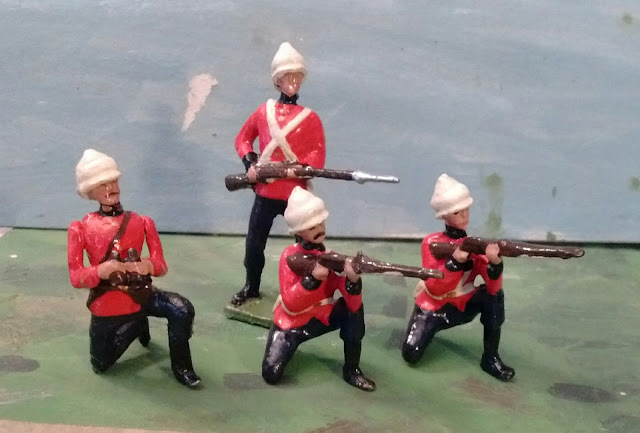 Now that I've started painting simple glossy 40mm toy soldiers it was easier to finally undertake proper renovations to the antique toys that have come to me. What a joy it has been to start producing proper toy soldiers for wargaming! 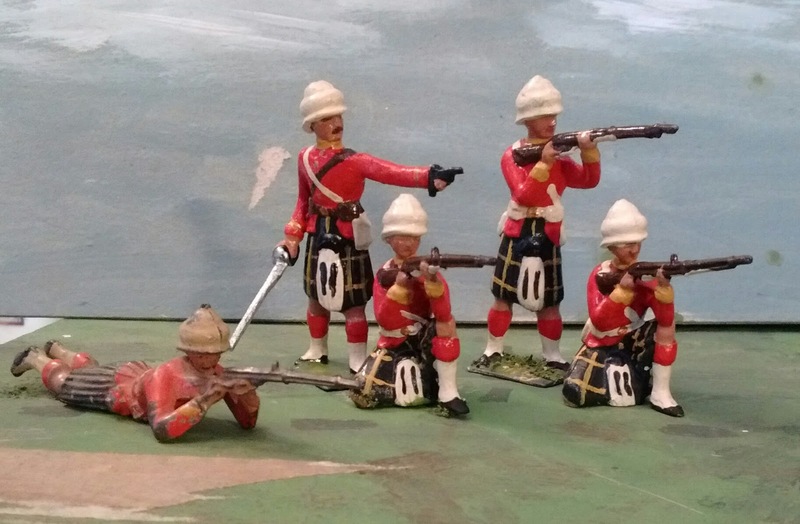 Vintage Britain's Gordon Highlanders. The 3 kneeling and standing firing figures have been repainted, the Officer was converted from a broken firing figure, the prone figure shows their original condition. The helmets and belts are a little too white but I Like'em! Originally the Highlanders probably came with an officer with binoculars, but if they did he was lost before they came to me. There were 4 broken figures out of 9 though so I decided to convert a broken firing figure to an officer. His body pose was all wrong for adding binoculars but seemed suitable for a highland version of Britain's iconic sword and pistol officer pose. Highlanders from Andrew Rose's Collector's Guide to Toy Soldiers. Note the two officers with movable binocular arms. CIV Officer from Andrew Rose's Collector's Guide to Toy Soldiers. Now, this is officially a small, limited project. 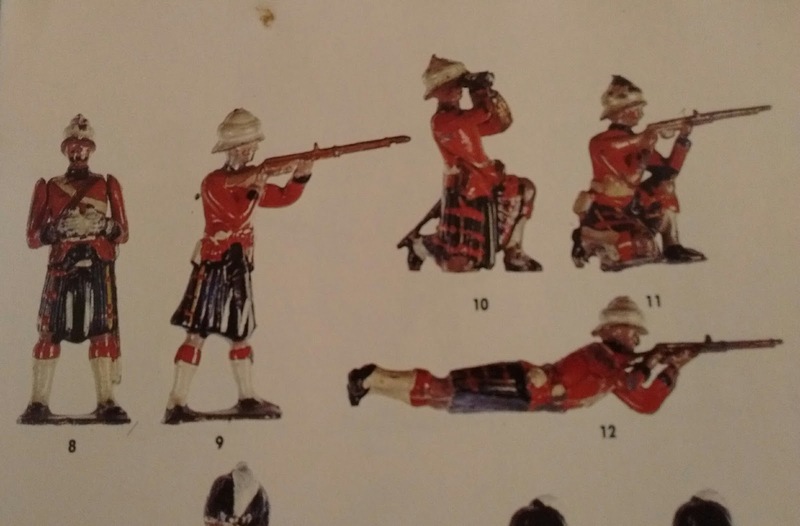 I have planned six forces in all: Canadian, US, Cree, British, Zulu and Boer, each initially to be of less than 50 figures and preferably closer to 30 where possible. All armies were to be recruited largely from what I already had on hand or could cast. I had started off with 4 figure units for the NorthWest but upped it to 6 because I was enjoying painting and converting the figures! I had ample figures and moulds on hand so upped the numbers to indulge myself. 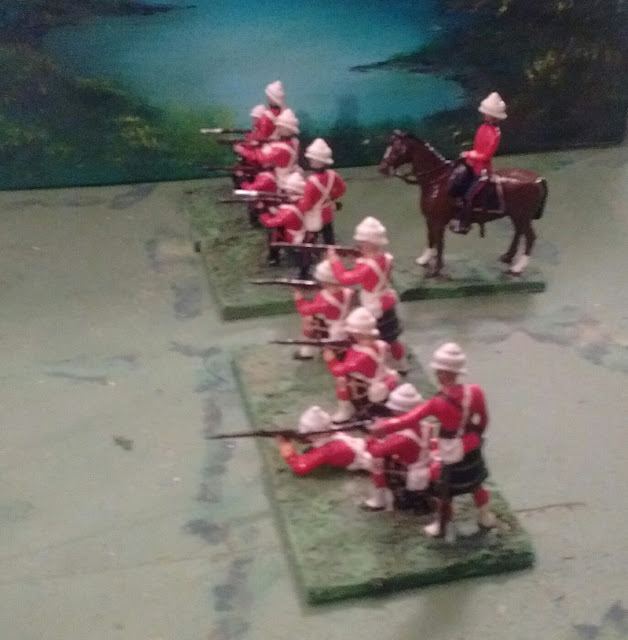 For South Africa I decided to try cutting down the British units to 4 figures so that visually the Zulus would out number them even if they had the same number of units. It seemed like a good idea to keep things standard though so I made a note to reduce all regular units in all the armies back down to 4 as well. 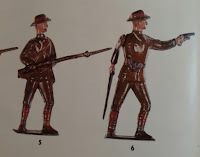 Four men might make a company but it wouldn't use all the figures in hand or look like a battalion so I proposed fielding 2 companies from each regiment to allow a variety of uniforms even in a small force. Once I reviewed what I already had, I found elements of at least 10 British/Canadian infantry regiments. If you add cavalry and artillery we're edging up on potentially 30 tactical units each occupying 1 square. My table is 12 squares wide. Even if I made two separate British forces that never saw each other, they would each still be too big to fit! When I was young my Mom used to tease us about "our eyes being bigger than our stomach" if we took too much and couldn't finish it, an expression passed down from my grandmother and who knows how many generations before. That was basically the case now. I had starting to plan bigger armies than I was likely to finish or could use or display if I did. I needed to scale back and field fewer but slightly bigger units. 58th Foot, now 4 strong with 2 more waiting. The officer has been "rebadged" from the Hochelaga Fusiliers (headswap and repaint - See him in action with his old unit in Dec 2015 here). 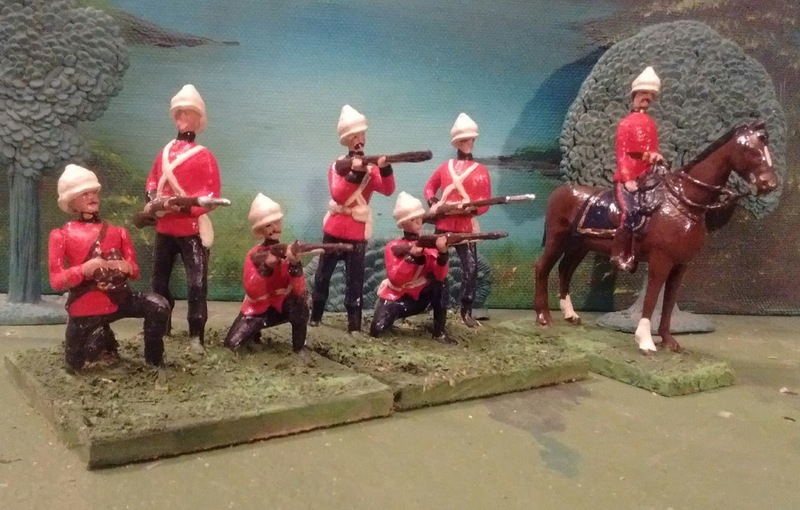 Having talked myself out of doing realistic but un-Britainlike stained helmets and belt, I decided to be truer to history, toy soldier history that is, and removed the pointed, laced cuffs. If Britain's did facings you got a swipe of colour and that was it! 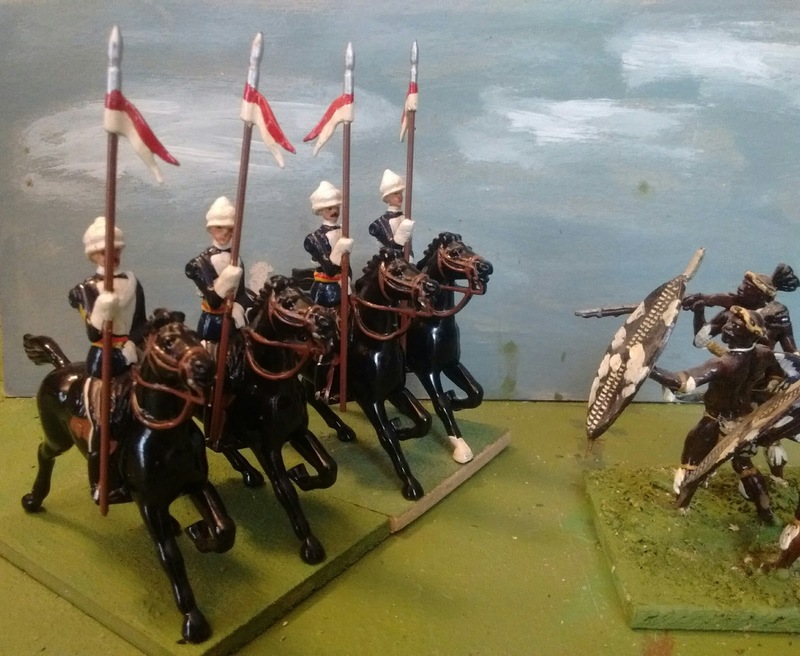 I like the single rank look for this period so I have decided to revert to the existing plan of 6 figure units grouped into "brigades" of 3 or 4 "companies" plus a Mounted Officer. This will accommodate most of my existing 54mm figures with just a few small additions (apart from the non-existent Boer force). 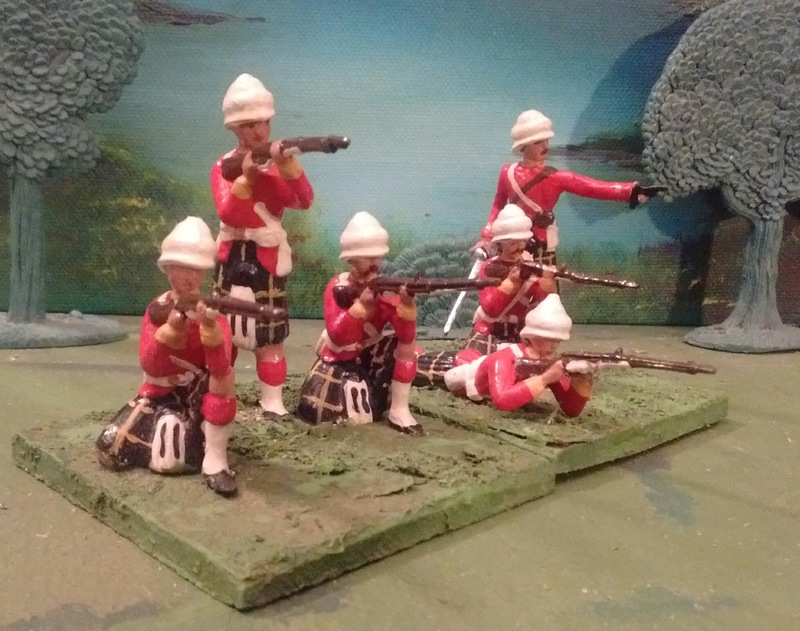 For my South African British force I just need to add 2 figures to the 58th, refurbish 2 more Gordon Highlanders, add another company of British infantry in helmets, refurbish enough sailors to field a Naval Brigade company, convert 4 lancers to sun helmets, convert a gun crew to helmets and paint up a mounted Brigadier in helmet. Then I'll start the Boers, being mounted infantry they will get only 4 figures per unit like the cavalry (unless doing 25 conversions leaves me wanting to do more!) . I'm not sure yet if I will rebase the Zulus onto slightly larger bases to allow an increase to 8 or 10 figure units or just field more units! On Wednesday I made the trek cross province to Ron's for a Sudan game. 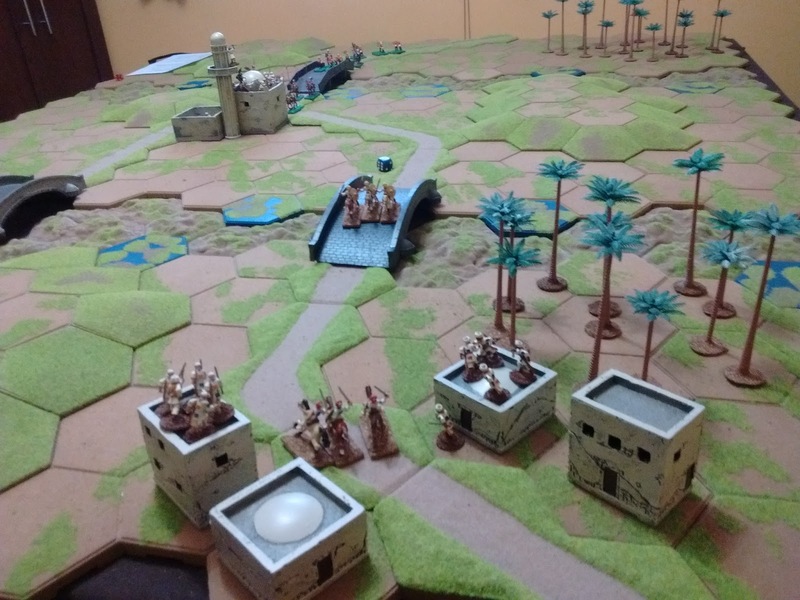 When I arrived I discovered that he had laid out the example Colonial game from Bob Cordery's Portable Wargame but with British instead of Egyptian troops on the Imperial side. The second game nears the end. 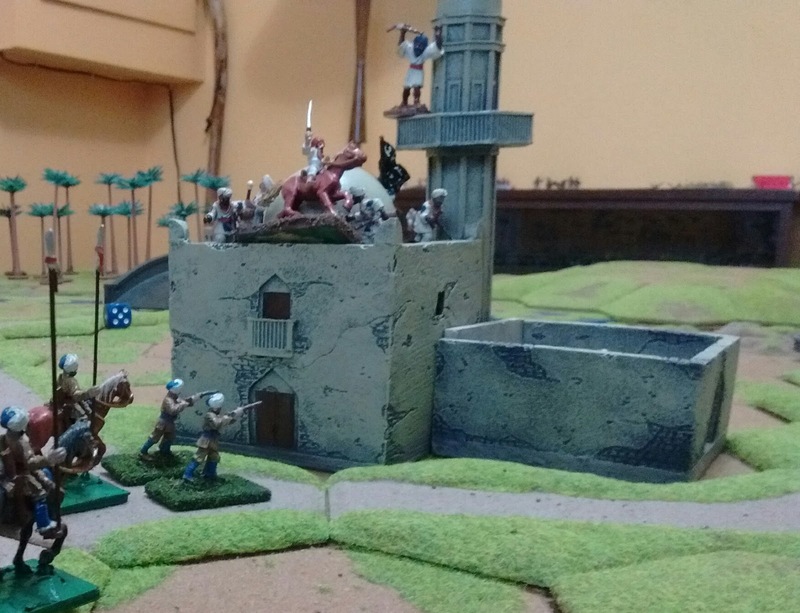 Mostly 25mm Ral Partha with a handful of Minifigs apart from some Airfix Camel Jockeys and my Scruby Arab cavalry. We played the game twice. First time around we played straight up and realized we had both made mistakes about how the Strength Points work. I had read the Sudden Death option first which has a 50℅ exhaustion rate and missed that the basic or Roster system had a 30% loss exhaustion point. We had both missed that the book makes no reference to the strength point value of units lost but just a loss of strength points. This means that an army can be exhausted without losing a single unit which rather makes reserves less valuable. A look at the example was of no help since in the last turn, the Egyptians dropped below to 30% mark whether counting the SP's of destroyed units or just the percentage of overall SP's. 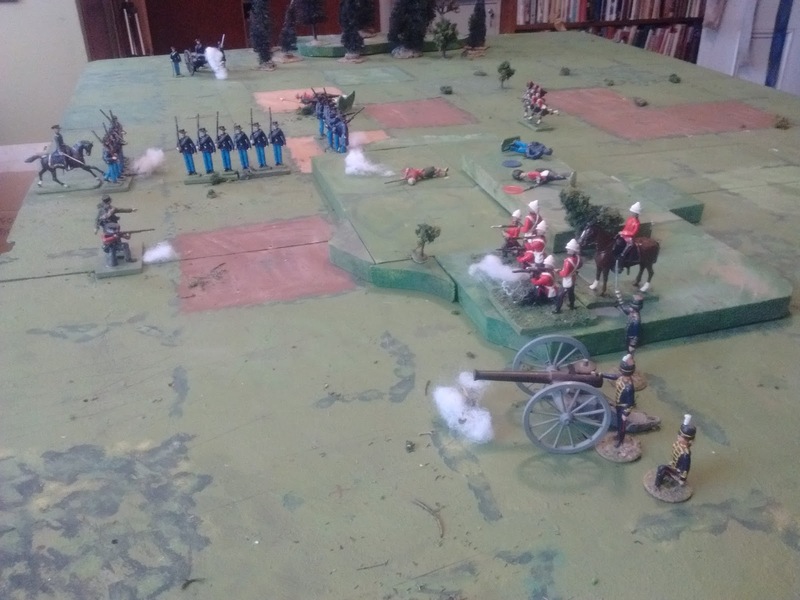 In any event it took about nearly two hours before I ground down the British to their exhaustion point and managed it by only using my gun and the muskets of my cavalry and better infantry. With a string of spearmen across the table behind a line of hills the exhausted British had no option but to retreat. The outcome was never in doubt. We reset the table and played again using sudden death. Since the number of figures per unit was irrelevant we beefed them up to look better. This game took a bit less than an hour but it was exciting/nerve wracking and involved some hard thinking. Until about the second to last turn the outcome hung in the balance and only some favourable luck saved the faithful, inspiring three units of poor troops to retreat rather than be destroyed and blinded the infidels' sight so that two successive artillery shots needing 2 or better to hit, missed! A double move then allowed the venerable Airfix tribe to exploit a gap to make a flank attack and things started to slide for the British. That second game was the sort of fun game that makes you want to reset and play again but it was time to head home.